For other people named Jason Clarke, see Jason Clarke (disambiguation). 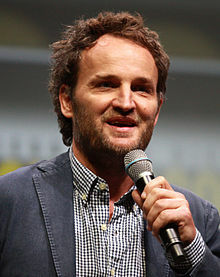 Jason Clarke was born and brought up in Winton, Queensland. His father worked as a sheep shearer in rural South Australia outside a small township of Padthaway on the limestone coast . Clarke has made many Australian television appearances, including Murder Call, Wildside, Home and Away, Heartbreak High, Blue Heelers, All Saints, Farscape, White Collar Blue, and Stingers. He played Tommy Caffee on the Showtime series Brotherhood. He has appeared in such films as The Human Contract, Death Race, and Rabbit-Proof Fence. Clarke played "Red" Hamilton in the 2009 film Public Enemies. In April 2010, he was cast in the thriller film Texas Killing Fields. He also played Detective Jarek Wysocki in the 2011 Fox series The Chicago Code and CIA interrogator Dan in the 2012 film Zero Dark Thirty. Clarke played a major role in the 2012 crime film Lawless. He played George Wilson in the 2013 remake of The Great Gatsby. Also, in 2013, he played ruthless terrorist leader Emil Stenz in White House Down. He played Malcolm in the 2014 film Dawn of the Planet of the Apes. In 2015's Terminator Genisys, Clarke portrayed John Connor, and the film grossed over $440 million worldwide. In 2019, Clarke starred as Louis Creed in the new adaptation of Stephen King’s novel, Pet Sematary. The film received praise from critics, being called by one reviewer "the best Stephen King adaptation ever." 1996 Diagnosis: Murder Rick "Slick" Brooks Episode: "A Model Murder"
1998 Two Guys, a Girl and a Pizza Place Hank Episode: "Two Guys, a Girl and a Recovery"
1998 Murder Call Zac Hartman Episode: "A View to a Kill"
2001 Flat Chat Episode: "Dark & Stormy Night"
2001 Head Start Constable Rogers Episode: "Out of the Blue"
2001 The Bill Agent Vinten Episode: "Beech on the Run"
^ "Jason Clarke biography". tribute.ca. ^ Slane, Kevin (5 April 2018). "What critics are saying about 'Chappaquiddick'". Boston.com. ^ David Hochman (2 May 2011). "Jason Clarke: Chicago's Finest". TVGuide.com. ^ "Jason Clarke Plays Politics on New Drama". Fox News. ^ "Jason Clarke Next to See Murder in The Fields". DreadCentral. ^ "The Battle for 'The Fields' Continues With New Casting". BloodyDisgusting. ^ "The Chicago Code". TVGuide.com. ^ Kroll, Justin (24 January 2011). "Jason Clarke visits 'Wettest County'". Variety. Retrieved 10 February 2011. ^ Stephenson, Morris (18 February 2011). "'Wettest County in the World': Star of moonshining movie makes visit to learn dialect". thefranklinnewspost.com. Archived from the original on 4 January 2013. Retrieved 18 February 2011. ^ "Terminator Genisys". BD.com. 18 February 2011. Retrieved 18 February 2011. ^ "Pet Sematary First Reviews: One of the Best Stephen King Adaptations Ever". Retrieved 10 April 2019. ^ "'Zero Dark Thirty' Tops Chicago Film Critics Awards". IndieWire. ^ "The 2012 Voice Film Critics' Poll". Village Voice Film Poll. ^ Aiello, McKenna. "Gotham Awards 2017 Winners: The Complete List". E! News. ^ "Three Billboards triumphs at Screen Actors Guild awards". BBC News. Wikimedia Commons has media related to Jason Clarke.